Delicious chocolate chip cookies are taken to the next level with the addition of Snickers Bites. Last week I left the house by myself for the first time in over 8 weeks. No Eric, no Elle, no Mom. Just me. And it felt weird. Way weird. I needed to run a few errands – the grocery store, dry cleaner and Target – and although I was only gone for about 2 hours, it felt like an eternity. And I’m pretty certain that I sent Eric no fewer than 10 texts to check on Elle. While in Target, I found myself aimlessly walking around for about an hour because I hadn’t basked in the glory of Target in months. Of course, I perused the baby section and picked up several adorable onesies – because the gazillion we already have just aren’t quite enough. I then made my way over to the candy section, aka jelly bean heaven. Seriously, does every single fruity candy have a jelly bean flavor? Not that I’m complaining, because I’m all about Nerds Bumpy Jelly Beans and I’m hoarding several bags of SweeTarts Jelly Beans. WHY do candy companies think we only want jelly beans at Easter, I ask you?! I also came across a bag of Snickers Bites. Since I’m a sucker for anything mini, I immediately tossed a bag into my cart alongside enough candy to rival the Easter Bunny’s stash. Eric and I both had chocolate chip cookies on the brain for days, so I decided to whip up of batch of giant chocolate cookies and mixed the Snickers Bites right into the dough. The result was a deliciously unique cookie full that nougat, caramel and peanutty flavor that we all love so much. If you’re a fan of the whole candy-baked-into-cookies idea, you’ll definitely want to check out my Rolo Cookies and my Reese’s Cup Cookies – they’re both pretty amazing! Preheat oven to 375°F. Line a baking sheet with parchment paper or a silicone baking mat. In bowl of electric mixer fitted with the paddle attachment, cream together butter and sugars until well blended and fluffy, about 4-5 minutes. Add eggs, one at a time, mix in vanilla and beat until well incorporated. In a large bowl, whisk together the flour, salt, baking powder, and baking soda. Gradually add dry ingredients to the wet ingredients and mix until just combined. Add in chocolate chips and Snickers Bites. Turn mixer speed to medium-high and mix dough for about 30 seconds. This will break apart the Snickers Bites and incorporate the pieces into the dough. If you are not working in a stand mixer, you will need to roughly chop the Snickers Bites before mixing them into the dough. Use a medium cookie scoop to scoop two mounds of dough per cookie (3 tablespoons total) and roll dough into balls. Place each dough ball onto the prepared baking sheet and bake in the preheated oven for 14-18 minutes or until very lightly browned, taking care not to overbake. I baked mine for 16 minutes, which seemed to be perfect in my oven. 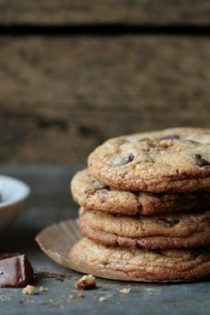 Allow cookies to cool on pan for 5 minutes before removing them to a wire rack to cool completely. 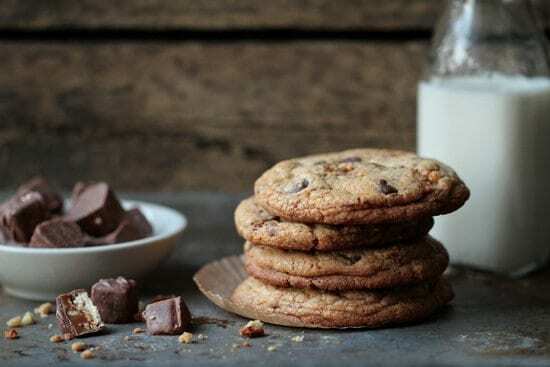 I chose to make large Snickers Cookies, if you make smaller cookies, you will need to reduce the baking time to 10-12 minutes. 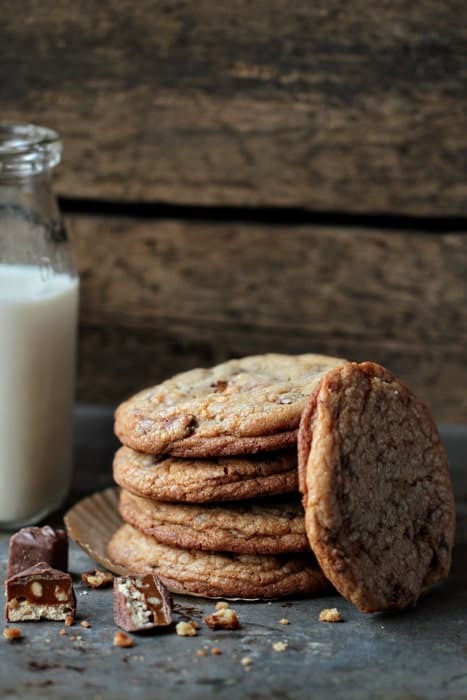 Snickers Cookies are best served the day they are made; however, the cooled cookies can be stored in an airtight container at room temperature for a few days. Snickers anything is always a good idea! These look great! Ah, those one and two hour trips out alone are such a treasure . . . and they hardly ever happen! If I had an hour alone though, I would probably head to Target right now too. These cookies look fantastic – can’t wait to try. Thanks for stopping by, Allison! I have been buying black jelly beans all year long from a local candy company. I agree, I want jelly beans year round. Mmm, sweet tarts! These cookies look amazing. You really can’t go wrong with buttery cookies stuffed to the brim with snickers. Yum! Yes! Another black jelly bean lover – everyone always thinks I’m crazy because I’m the one picking the black ones out to eat – not throw away! Thanks for stopping by! I totally agree on the Starbucks point! Nothing like a warm beverage and meandering through the aisles of Target! Thanks so much for stopping by! these cookies look perfect! everything about them. Thanks so much Natalie! Definitely pick up the SweeTarts flavor, they’re amazing! I love just wandering around when I shop sometimes it is so relaxing. Love this cookies! I can usually find them at Target or Kroger. When all else fails, I believe you can get them online through King Arthur Flour. Snickers are the best! These cookies sound delicious! Made these today and they were a big hit. With these and your rolo ones..my cookies come out more rounded/raised and yours pictured seem flatter. Wonder if I should cut back a little on the baking powder. They were delicious regardless and I love your recipes..thanks for another winner! Also, congratulations to you and your family! Just tried the recipe tonight. Three thumbs up from my crew. We will definitely be making these again.